Sometimes it works out that you get to work on projects you love. As a business owner, it’s a perk to get to seek out projects that inspire you. 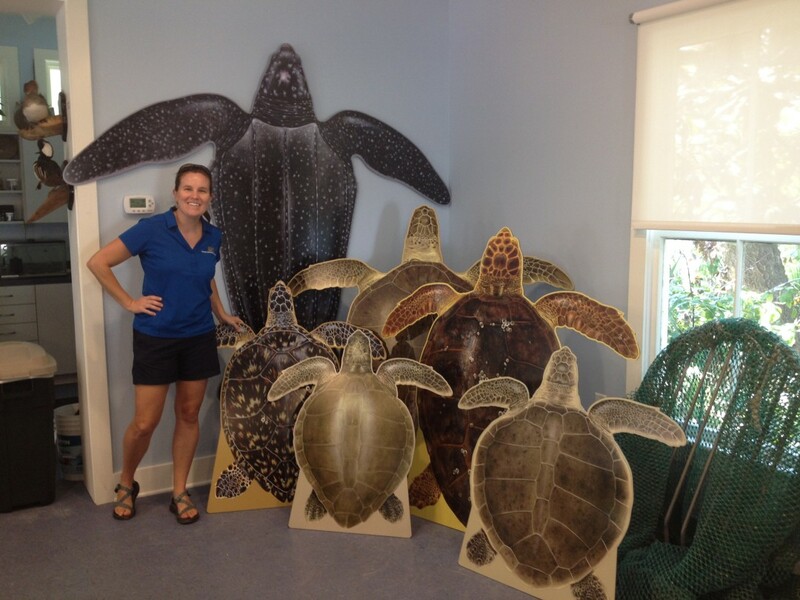 In April I met a client at the South Carolina Federation of Museums conference who wanted life-size turtle cutouts of a leatherback sea turtle, green sea turtle, loggerhead sea turtle, hawksbill sea turtle, Kemp’s ridley sea turtle, and an Olive ridley sea turtle. Initially, making turtle cutouts sounds routine, but the leatherback sea turtle’s carapace (shell) length is 62 inches. 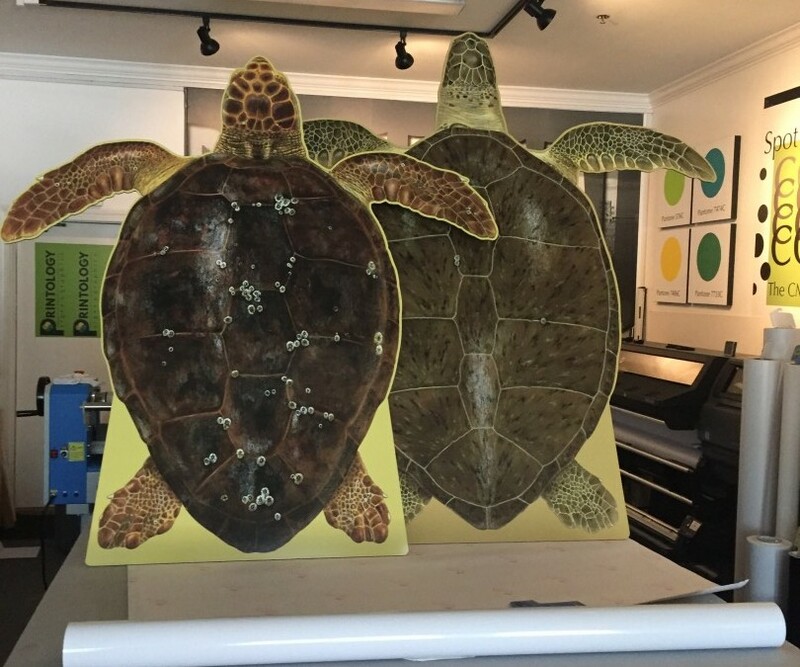 And since these turtle cutouts will be used for educational purposes at the Coastal Discovery Museum they had to meet some requirements: smooth edges, sturdy, stable, portable, and they had to look real. The client asked, can you do that? In my mind this was a quick, “yes we can do that.” I have a history with turtles. I once traded my pet dachshund for a box turtle in Tennessee. Within a few days my turtle had ran away and the neighbor boy still had my dog, Hans. I learned a lesson but didn’t lose my love of turtles. Other times growing up, my dad would bring home a turtle of some sort and it too would choose an alternate home. As a married adult, I turtle sat Betty and Barney, our friends’ Galapagos tortoises in their apartment in Burbank, California. Then when we had children, my husband found in our yard after a particularly heavy Georgia downpour, a fairly large turtle. We housed it for a few days, but decided it was better off in our backyard than a box in our garage. We also weren’t certain that our perpetually hungry chocolate lab wouldn’t try to eat it. After that we chose to just visit turtles at aquariums or on trips to the South Carolina coast, where we discovered loggerheads. Loggerheads, those amazing creatures that upon hatching swim hundreds of miles to the Gulf Stream and then after the females mature return to the place they hatched to lay their eggs. On these trips, we would go on turtle walks and see where the nests had been marked, but it was only after moving to the Beaufort area that we actually saw a female on the beach and our first hatchlings. My high school daughter and I had joined the turtle patrol and walked the beach each Sunday morning for a summer looking for nests. We learned to spot the tracks, which up until this point I had thought were golf cart tracks, probe an area for the nest, dig a hole to relocate the nest to a safer spot, count the eggs, and carefully with a blue-gloved hand place the eggs in the new nests. This, I must say, was not pleasant. It’s hotter than hot on those windless early morning walks and those nests have a distinct smell. Then later in the summer during the evenings when we would return to certain nests to help any remaining hatchlings out to the ocean, we felt gratified seeing those brave little guys swim determinedly toward the Gulf Stream. When the season ended in early September, we turned in our probes, turtle patrol shirts, and blue gloves. Others were better suited for this hands-on mission. So the museum turtle project allowed me to support a cause I believe in. Hoping these turtle cutouts inspire in others my love of turtles.